NPR Best Books of the Year In the world in which Lizbet Lenz lives, the sun still goes around the earth, God speaks directly to his worshippers, goblins haunt every cellar and witches lurk in the forests. Disaster strikes when Lizbet's father Gerhard, a charming scoundrel, is thrown into a dungeon by the tyrant Hengest Wolftrow. To free him, Lizbet must cross the Montagnes du Monde, globe-girdling mountains that reach to the sky, a journey no one has ever survived, and retrieve a mysterious book. Lizbet is desperate, and the only one who can help her is the unpleasant and sarcastic witch girl Strix. As the two girls journey through the mountains and into the lands of wonder beyond, on the run from goblins, powerful witches, and human criminals, Lizbet discovers, to her horror, that Strix's magic is turning Lizbet into a witch, too. Meanwhile, a revolution in Heaven is brewing. 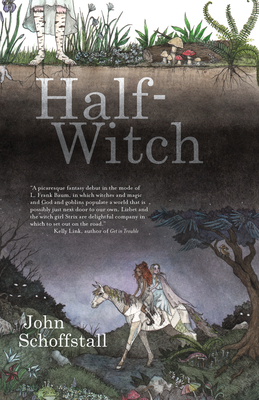 John Schoffstall has published short fiction in Asimov's, The Magazine of Fantasy & Science Fiction, Interzone, Strange Horizons, and other venues, and was a Grand Prize winner of the Writers of the Future award. He is a physician, and once practiced Emergency Medicine. Now he follows Candide's advice and tends his own garden. He lives in the Philadelphia area. He has a website at www.johnschoffstall.com.